Who maintain a constant silent watch on the enemies of their country. Their past and continuing contribution to Britain's operational success in peace and war can never be told in full. (This is currently a draft account of the Regiment, its associates and history of its time as an intercept station compiled by Fred Searle. The Royal Corps of Signals remain one of the largest Corps in the British Army and plays a vitally important role within it. Notwithstanding, the latest round of defence cuts will take its toll and there can be little doubt that our armed forces of the future will be considerably smaller in all aspects. Whether or not their commitments will also be reduced is a matter of both conjecture and debate. Responsible for the installation, maintenance and operating of its large inventory of telecommunications equipment and information warfare systems; it was charged with providing command support to commanders and their headquarters, and with conducting electronic warfare (EW) against enemy communications. In general terms, it was and still is the army's eyes and ears without which the modern army could not function. From flag and line to the Larkspur and Clansman radio and on to the new digitized age of Bowman; the Corps uses state of the art technology and adheres to the principle that such technology is only as good as the personnel needed to drive it. During the Cold War period the Corps had two dedicated signals intelligence (Sigint)Regiments. 13 Signal Regiment (Radio) based in Germany as part of the British Army of the Rhine (BAOR) and 9 Signal Regiment (Radio), Cyprus, in the Middle East. Sigint Intelligence collection and its subsequent analysis and reporting required highly trained and motivated men and women, usually stand alone and one off equipment and specialised technicians. With the exception of sport; where both Regiments enjoyed much success, although an integral part of the Royal Corps of Signals; they rarely enjoyed the benefit of being part of it. Their covert activities set them apart from other Regiments and the Corps in general. This eventually led to less and less contact and subsequently, reduced recognition of the role that they played. Over time this had an adverse affect on the promotion and career prospect of the Royal Signals sigint community; where advancement for its personnel was generally slower than that enjoyed by other similar trade groups within the Corps. This situation existed until the mid to late 1960's, when with GCHQ's support, DI(24)A, was given majority responsibility for promotion, postings and training. Radio intercept networks were formed during the first World War when specialist radio operators, cryptanalysts and linguists had considerable success in deciphering military, messages transmitted by the enemy. A Government Code and Cypher School (GC&CS) led by Alastair Denniston, was also established in November 1919. Later, GCCS and the Secret Intelligence Service (SIS) were placed under the control of the Foreign Office. On 1 April 1946 it became Government Communications Headquarters (GCHQ). (A detailed and interesting history of GCHQ can be found on their very comprehensive website at http://www.gchq.gov.uk/history/) It was not until the Second World War and the subsequent Cold War years that sigint finally came of age and played such a crucial role in defence of the free world. From the intercept and breaking of the German Enigma "E traffic codes in the second World War, to Operation Gold, during the Cold War; the joint British American mission which in 1954 involved building a tunnel from the American Zone in Berlin, designed to tap major Soviet, East German and Polish phone communication facilities. An operation which although blown by the British double agent George Blake and eventually exposed by the Soviet authorities, secured a huge amount of intelligence about the Soviet,East German and Polish command facilities. These reported and many unreported intercept coups heralded the fact that signal intelligence had finally evolved. 9 Signal Regiment (Radio) - Ayios Nikolaos Cyprus. 14 Signal Regiment (EW) - Celle, Germany. 12 Wireless Squadron - Degerndorf, Bavaria, Germany. 223 Signal Squadron - Flowerdown, Winchester. 224 Signal Squadron - Woodhouse, Loughborough. 225 Signal Squadron - Langeleben, Germany. 226 Signal Squadron - Wesendorf, Germany. E Troop 30 Sig Regt - Blandford. 4 Communications Company - Cheltenham. 26 Signal Unit RAF - Gatow, Berlin. CFS Alert - Ellesmere Island, Canadian Artic Archipelago. HQ Radio Group - HQ BAOR, Rheindahlen. The Regiment's sigint activities had its beginnings at Aldershot in 1934 as a small independent War Office Signals controlled unit known as No 4 Wireless Company, under the command of Major E L Farnell. In 1936, he handed command to Capt H D Mountford who went on to command 3 HQ and Signal Regiment in 1943. In September 1938 it was re designated No 2 Company GHQ Signals Home under the command of Lt. P W Lonnon. ( He went on to play a very significant role in the future life of the Regiment as one of its Commanding Officer's and was largely responsible for the newly constructed barracks and camp at Birgelen). The unit served with the British Expeditionary Force in France from September 1939 until final evacuation from Dunkerque in May 1940, whilst commanded by Major A E Barton. In July 1940 the title of the unit was again changed to No 1 Special Wireless Group. It was stationed in the UK at Harpenden in Hertfordshire, until July 1944, under the command of Lt Col A E Barton. A small detachment returned to France in July 1944, and by September of that year 1 Special Wireless Group, was again on the continent with HQ 21 Army Group in North West Europe serving in various locations in Belgium, Holland and Germany. On the 3rd October 1944, 3 Wireless Company which included Matthew Japp,Jimmy Jarman and his D/F Crew crossed the Dutch/German border into the deserted German village of Wehr with their DF Loop, at Sittard with the 5th Battalion Coldstream Guards and tanks of the Guards Armoured Division and positioned itself in Wehr. 3 Coy then proceeded to the Ardennes. 116 Special Wireless Section; one of numerous SWS's, was part of this operation and in February 1945, Jim Jarman's, (one of our members) DF section was attached to the 137 US Army Radio Intelligence Coy, 9th US Army under the command of Field Marshal Montgomery, 21st Army Group. On 23 March 1945, units of the 21 Army crossed the river Rhine near the German city of Wesel. After meeting fierce resistance, British, Canadian and American units advanced into the German areas of Nordrhein-Westfalen, Niedersachsen and Schleswig-Holstein, with the British Army occupying the north of the country. In May/June 1945, 1 Special Wireless Group, commanded by Lt. Col E Wilks, arrived in Minden and was renamed No 1 Special Wireless Regiment. All Sigint operator personnel known at various times as, Operator Special, Special Operator and Special Telegraphist, were trained at 10 Wireless Training Squadron,(10 WTS) located in the village of Woodhouse, near Loughborough. It became 224 Signal Squadron in 1959. It had a sequence of Squadron Commanders amongst who were: Major Bruce Bovey, Major Wilbour-Wright, Major Ralph Beard MBE and Major John Ellingworth. The Squadron was responsible for all operator B111 - B1 (later became A111 - A1) trade class training, as well as Supervisor Radio training for its advanced operators; some of whom went on to become specialist officers and Squadron Commanders within the Sigint organisation and the Corps generally. Part of the basic trade training syllabus contained high speed morse reading, tape reading, Electricity and Magnetism modules, Foreign Communications Procedures, Non-Morse (Nomo) and equipment manipulation tests. It absorbed 223 Signal Squadron (Radio)in March 1976. This Squadron was reformed in April 1967 and was based at Bushfields Camp, Flowerdown, near Winchester. In November 1980, 224 Signal Squadron (which ceased training in 1990), became Communications and Security Group (UK),(CSG(UK)); forming from 4 Communications Company which was located in Cheltenham. The first OC/CO of CSG(UK) was Maj M Grieve, Royal Signals. He handed over command to Lt Col John Dobson, Intelligence Corps, who became the first Lt.Col appointment from this Corps to command a major sIgint unit. He later passed command to Lt Col T Ridger, Intelligence Corps. Part of the Group consisted of 2 Squadron (Radio), commanded by Major F Searle. This Squadron was responsible for all operator intercept training for 13 Signal Regiment (Radio) and its sub-units, as well as 9 Signal Regiment (Radio) Cyprus. The Group also parented the Special Projects Agency (SPA), which was commanded by a Technical Officer Telecommunications (TOT). The Group moved to Defence Special Signals (DSS) Chicksands, in 1998. During the period of the Cold war, regimental manpower came predominately from the Royal Corps of Signals, the Intelligence Corps and the WRAC. These formed the main operational component. The former having responsibility for intercept collection and the latter two for intelligence analysis and reporting. Other elements consisted of personnel from the Royal Pioneer Corps, Royal Army Pay Corps, R.E.M.E, Army Catering Corps, Royal Army Medical Corps, Royal Army Ordnance Corps, the Royal Army Medical Corps and others. All played an equally important part in the administration and logistical support of the Regiment. The Regiment had three home based Squadrons, 1, 2 and HQ. 1 Squadron was made up of all operating personnel. This was divided into a four way 24hr Troop intercept system; 151, 152, 153, and 154 Troops, later to become A, B, C, and D Troops. Each Troop was commanded by a Sgt/Supervisor Radio. The operational intercept commander was usually a specialist Sigint officer, known originally as the Set room Officer (SETRO) and later the Military Operations Officer (MOO). He was responsible for all operational manning, equipment and personnel. it also had remote detached HF DF sensors as well as other elements at AÃ¼gsberg, Wesendorf, Degerndorf, Dannenberg, Bad Aibling, Herzo Base, Effeld, RÃ¤bke and WÃ¼sterheide near Cuxhaven. 2 Squadron consisted of Intelligence Corps and WRAC personnel. (In 1970 its detached personnel in Gatow, became 3 Squadron, 13 Signal Regiment (Radio)). HQ Squadron provided the traditional administration and logistical support as well as a Military Training element. At various times, the Regiment also had attached personnel seconded from the Canadian Intelligence Corps, Royal Canadian Corps of Signals, (now part of the Communications and Electronic Branch) and the Royal Australian Corps of Signals, as well as elements from other agencies. The creation of the "Iron Curtain" by the Soviet Union following WW II and built on 13 August 1961, cut off almost all contact between East and West in Europe by dividing the three Western sectors of Berlin from East Berlin and the GDR. The ideological differences between Communist and non-Communist countries, started when the USA, Britain, France and the Soviet Union, disagreed over the control and governance of occupied Germany. In 1946 tension mounts between the East and Western block of nations. Stalin states that communism and capitalism were incompatible. Whilst Churchill states that an 'Iron Curtain' has descended on Europe. In August 1946, whilst commanded by Lt. Col A E Barton, the Regiment moved to Peterborough Barracks GlÃ¼ckstadt near Hamburg, a town in Schleswig-Holstein, situated on the right bank of the river Elbe. Formerly it was a German U-Boot crews shore accommodation base, providing rest and recreation facilities for the survivors of the Battle of the Atlantic. (At the outbreak of the Second World War it was known as U Boat Training facility Number 14). 1RTR became the first British occupants of the barracks at the end of the war. The Regiment was renamed No.1 Wireless Regiment in 1947, whilst under the command of Lt Col F S Pipe-Wolferstan. Sigint intensity increased significantly when in February 1948 the Communist Party take control of Czechoslovakia, after President Edvard BeneÅ¡ accepts the resignation of all non-communist ministers. Whilst In June of that year,the Soviet Union blockaded all surface transport into West Berlin. The West responded by flying coal, food, and medicine to the city by military aircraft, an air-lift that lasted for over a year and which kept the city alive. 1 Wireless Regiment remained in GlÃ¼ckstadt until February 1950 when it transferred to Nelson Barracks MÃ¼nster,(named after Major David Nelson VC) commanded by Lt Col R G Yollsnd OBE. The sigint operation was carried out from the top floor of one of the Blocks of the former German army barracks. 101 Wireless Troop, a sub-unit of the Regiment based in Hildesheim; under the command of Lt Col S J Dagg MBE, was assigned the task of finding a border site suitable to conduct electronic warfare (EW). The site chosen was Langeleben close to the town of KÃ¶nigslutter am Elm. Langeleben became operational in 1952 and was given the name of Anderson Barracks, but always tended to be referred to by the more popular names of 'Langy', or 'Langeleben'. Initially billeted under canvas; the intercept operations main task was the monitoring and decoding of military voice and morse transmissions of the Soviet and National Peopleâ€™s Armies in East Germany. This was carried out from within two 'back to back' Bedford QL vehicles, operating HRO HF and AR 88, and later, Eddystone receivers. (See receiver pictures-Equipment page). In early 1958 when work started on the new accommodation build, intercept was conducted from within a purpose built operational set room. This Squadron was a very popular posting for both National Service and Regular soldiers. Not only did it enjoy a unique location, it provided vitally important information on the East German and Warsaw Pact countries at a time of heightened tension. The intelligence collection process was in the main, exciting and of a very high standard and contributed considerably to the overall sigint effort. Whether or not it had as much success as its East German counterpart within the Hauptabteilung III, the Sigint directorate of the MfS;(Hauptverwaltung Aufklanung ((HVA)) which was modeled on the KGB, is unlikely and in any event will probably never be known. This organisation waged an enormous sigint assault on the West with Stasi providing 80 percent of all Warsaw Pact intelligence on NATO and its member states. Over the years, the Squadron built up a close relationship with the people of KÃ¶nigslutter, a friendship which exists to this day. 101 Wireless Troop was re-named 2 Squadron, 1 Wireless Regiment in 1957. (A detailed account of the Squadron can be found on the Langeleben web site:(http://www.langeleben.co.uk/). Following the signing of the Austrian Independence Treaty on 15 May 1955 in Vienna at the Schloss Belvedere between the Allied occupying powers, all occupying Allied forces in Austria since the end of WW2 were obliged to leave, in order to respect the neutrality of the newly independent country. The last of these left Austria in September 1955. Amongst these were units of the Royal Signals which had been operating near Graz. They were relocated in August 1955 to a small village in Germany just over the Austrian German border called Degerndorf, Bavaria and were based in Karfreit Kaserne, Brannenburg. They were known as 12 Wireless Squadron, a sub unit of 1 Wireless Regiment. At the time of the move the Squadron was commanded by Major Francis and later by Major Sugden. 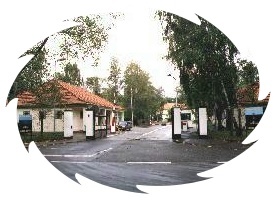 The Sigint operation was conducted from the first floor of the southern barracks. This housed the intercept, DF, cipher section and all technical support. This Squadron did not always share the limelight of its sister Squadrons, but its contribution to the overall sigint effort, should not be underestimated. In July 1958, 12 Wireless Squadron closed and its personnel were transferred to the Regiment. In 1953 it was decided that the Regiment should move to a permanent location West of the Rhine and a site selected for the construction of a new purpose built Barracks was found near Birgelen on the German Dutch border. It was located close to the border at Rothenbach, on the road between the Dutch town of Roermond and the German town of Wassenberg, some 80 Km's north of Aachen, in North Rhine-Westphalia. Local rumour has it that the site selected was that of a former Roman Signal Station! Thanks to their drive and determination and that of others, the Regiment was able to occupy its new accommodation by May 1955. It was given the name "Mercury Barracks" and was credited with being one of the best barracks that the British Army had anywhere in the world. Shortly after the Regiment was established at Birgelen, a detachment, known as Royal Signals Detachment RAF Gatow, was raised in Berlin. The Gatow detachment moved to the Teufelsberg, just north of the Grunewald forest Kries Wilmersdorf, in the British Sector of West Berlin. The Teufelsberg (German for Devil's Mountain) is an artificial hill and rises about 80 metres above the surrounding Brandenburg plain. It was built by the Allies after the Second World War from 12 million cubic meters of WW2 rubble of Berlin. One of the most prized listening posts of the cold war; it was from there that they intercepted Soviet,East German and Soviet satellite countries, radio, telephone, microwave links and radar as well as satellite transmissions. Sigint intensity increased when riots broke out in Poland and the Hungarians staged a revolution in 1956.
jointly run by the US Army and the US Air force. The Regiment was designated 13th Signal Regiment (Radio) on 1 September 1959, whilst under the command of Lt Col J M Sawyers MBE, he in turn, passed command to Lt Col Tyrell-Gray MBE. Lt Col A T Scott OBE, then assumed command from 1963 - 1966. During this decade there were many volatile periods, from the Cuban Missile Crisis of 1962 (a major strategic intelligence failure) to the Vietnam War. In 1967, the Regiment was commanded by Lt Col P H Palmer; at which time 2 Squadron at Langeleben became 225 Signal Squadron. In 1970, whilst under the command of Lt Col P A C Baldwin, (later to become Major General CBE) the Royal Signals Detachment Gatow was re designated 3 Squadron, 13 Signal Regiment (Radio). Lt Col J N Taylor assumed command of the Regiment in March 1974. In response to a dramatic increase in operational activity, H Troop enlarged the already existing DF detachment of 1 Squadron (commanded by Maj John Milford) and formed at Gross Gusborn on the Elbe River in the Dannenberg Salient. The Regiment was commanded by Lt Col C T Garton from 1979-1981, when command passed to Lt Col M P Walker, who commanded until 1983. 13 Signal Regiment (Radio), was awarded the Freedom of Dannenberg in 1984, whilst under the command of Lt Col G W Howard. Lt Col J H Roberts assumed command from 1986 to 1989. In November 1989, after weeks of civil unrest in East Germany, which brought about the resignation of Erich Honecker, East Germany's head of state; the East German government allowed all GDR citizens to visit West Germany and West Berlin. Crowds of East Germans climbed onto and crossed the wall. After the fall of the Berlin Wall and the collapse of the Soviet Union in 1991, the end of the Cold War ushered in a new international order in which the West's copious surveillance blanket and the industries that drove it now needed to be urgently reassessed particularly in the field of counter terrorism and the lucrative international narcotics trade. H Troop was the first of the Regiment's outstations to close in response to the new political situation in Eastern Europe, with the last soldiers moving out in April 1991. A 'Closure' ceremony was held on the 2 March 1992 in London Block Stadium Barracks, Berlin to mark the occasion. The Commanding Officer at the time was Lt Col A M Wallace. On 02 July 1994 and after a period of 40 years of distinguished intercept history, 13 Signal Regiment (Radio) ceased its operation in Birgelen, under final command of Lt Col P A R Rouse. Exercise Mercury Sunset was the name given to the Drawdown celebration weekend organised by the Regiment. During the Drawdown ceremony, a bronze statute of 'Jimmy' was presented by the Regiment to the Deputy Mayor of Wassenberg. This is still on display in the offices of the local Rathaus Wassenberg. On the same occasion the Regiment was awarded and presented with the Fahnenband of the Federal Republic of Germany signed by the Federal Minister of Defence in Bonn. It reads: "In the spirit of the common task and in recognition of the services rendered in Germany in the cause of peace and freedom 13th Signal Regiment (Radio) has been awarded the Fahnenband of the Federal Republic of Germany". The final event of the weekend on Sunday, July 3, was a parade and drumhead ceremony held in Mercury Barracks. It disbanded in 1995, which was the 60th anniversary of the formation of its antecedent No 4 Wireless Company in 1934. After disbandment, the Regiment's role was transferred to RAF Digby in Lincolnshire with the formation of an integrated Army/RAF unit based upon the existing 399 Signals Unit RAF. 13 Signal Regiment (Radio) lives on in the guise of the Birgelen Veterans Association, (http://www.birgelenvets.org) which was founded in Oct 2000 by Fred Searle and Cyril Harding, two former members. With the help of Peter Clifton, it officially launched on 05 October 2012. It has a truly international membership base of some 500, all of whom are determined to maintain the family traditions of the Regiment. The Association also supports a German charity (Help for children with cancer) ensuring that our ties with the local Birgelen area remain strong. In 2012, with the help of John Chudleigh, the Associations German representative, it purchased a wooden bench seat on behalf of all past members of the Regiment and presented it to the Birgelen Golf Club. (A list of former Regimental Commanding Officer's can be found at the bottom of the page). During the years of the Cold War 13 Signal Regiment (Radio) played a vital strategic signals intelligence role. Increasingly, the need to create a tactical electronic order of battle (EOB) became important and on 1 July 1977, for the first time in British Army of the Rhine (BAOR), an entirely new signal regiment was raised for tactical electronic warfare (EW). It was named 14 Signal Regiment (EW) and was tasked with providing EW support to the Commander 1 BR Corps. On forming, it took under command, 225 Signal Squadron from Langeleben (became 1 Squadron 14 Signal Regiment), 226 Signal Squadron from Wesendorf (became 2 Squadron, 14 Signal Regiment) and E Troop, 30 Signal Regiment. It formed initially at Tofrek Barracks, Hildesheim where it's RHQ and 3 Squadron elements were based. The former contained the Regimental Command Post, administration and support elements, whilst the latter was responsible for providing Regimental communications. In April 1978, the Regiment moved to Ironside Barracks, the derelict former home of 7 and 11 Ordnance Field Park in the town of Scheuen, just north of Celle. Its formation proved a formidable task particularly in the light of the economic conditions which prevailed. New concepts, new equipment, dilapidated barracks, and the Regiments soldiery scattered across the Corps front were but a few of the obstacles encountered. Under the astute and able command of its first Commanding Officer, Lt Col. I.O.J Sprackling. (later to become Major General OBE) these were overcome and the Regiment went on to play a crucial and important role in support of 1 (BR) Corps. Eventually, a new home was found when 94 Locating Regiment RA vacated Taunton Barracks, Celle; a huge neo-Gothic complex dating from 1870 and which is now the Celle Town Hall. The Regiment took up its new abode in 1985. Many of its founder specialist tradesmen (Royal Signals and Intelligence Corps) came from 13 Signal Regiment (Radio). After interim stops at Hullavington and OsnabrÃ¼ck, the Regiment (which now has five Squadrons), moved to a former RAF station at Cawdor Barracks near St David's, Brawdy, South Wales, Pembrokeshire, in January 1996. Thereafter, it's EW deployment and contribution to the Afghanistan conflict has once again proved invaluable and a credit to the professionalism of its soldiers.